One Piece manga | SHANNARO!!! I’m sorry about last week, I didn’t have the time to do a review so I’ll be doing a double this week. I still don’t have much time so I’ll have to keep it short. Let’s start by going about Doflamingo’s past, Trebol, Vergo, Pica and Diamante have been spoiling Doflamingo since he was a kid. Killing anyone or destroying anything that’s in his way and dragged him down into darkness. All with the intent to make him the pirate king. Now back to the present, Luffy clashes with Doflamingo, keeping him away from Law. They go head to head pretty evenly until Doflamingo kicks Luffy into Trebol’s sticky body. For some reason Luffy can’t use his Haki while inside Trebol. Law uses the last of his energy to create a room and throws his severed hand at Trebol, cutting him up. This makes me think Trebol doesn’t ha ve a logia fruit, Luffy missed because he didn’t expect him to be that skinny. Trebol’s sticky liquid is flammable, enraged at Law’s attack he spreads the liquid all over the place and ignites it like a suicide bomb attack. Luffy manages to save law from the fire and throws him down to Robin. Doflamingo wants to stop him but everyone down there helps out to keep Law safe. Doflamingo has to finish his fight with Luffy first before he can head down there. 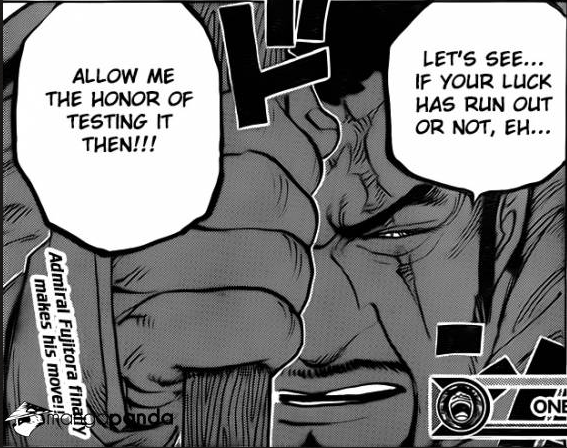 Law however doesn’t want to leave the battlefield, he intends to stay there until the battle is over. If Luffy loses he’ll accept his death as well. Both Luffy and Doflamingo have suffered injuries from their fights. Doflamingo took the heavy hit from Law and Luffy took a few good hits when fooling around with Bellamy. They clash for most of the chapter, Doflamingo having the upper hand. While arguing between them about who’s blocking who’s path Luffy decides to show us a trump card he hasn’t used yet. Gear 4. I’m really excited to see what kind of power it is.